a) High-resolution computed tomography scanning (case 1, 14 days prior to death) showing widespread ground glass opacification, faint nodules, thickening of the interlobular septa and small bilateral pleural effusions. b) Post mortem section with occlusion of medium-sized pulmonary arterial lumen by fibrointimal proliferation (of fibroblasts and collagen) (white arrowhead) and tumour emboli (black arrowhead) (haematoxylin and eosin, 4.3× magnification, scale bar=500 µm). c) Post mortem section showing a medium-sized pulmonary artery with two elastic layers, with a normal-sized smooth muscle layer. There is exaggerated luminal occlusion by fibrointimal thickening (white arrowhead) surrounding nests of tumour emboli (black arrowhead). The adventitia contains lymphatic tumoural thrombi. Increased alveolar macrophages are seen in surrounding lung (elastic Van Gieson stain, 4.6× magnification, scale bar=500 µm). 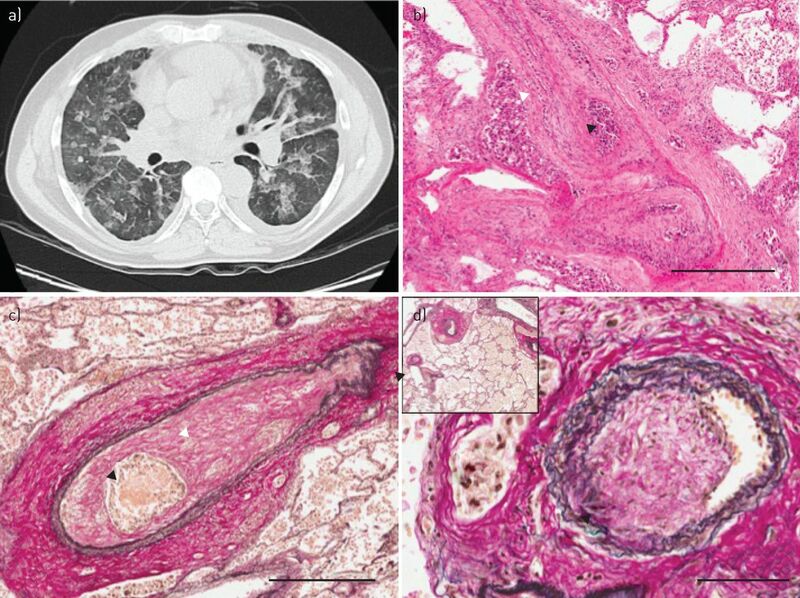 d) There was also evidence of fibrointimal proliferation within the lumen of small pulmonary veins (black arrowhead) and tumour involvement of accompanying lymphatic vessels (white arrowhead). Inset: veins close to the centrilobular bronchovascular bundles show eccentric fibrointimal remodelling (elastic Van Gieson stain, 3.4× magnification, scale bar=50 µm). Of note, in the sections we observed, pulmonary arterioles (80–100 µm external diameter) did not demonstrate significant vascular remodelling (elastic Van Gieson stain, 28.4× magnification).